Donate to Sustainable Ballard …. while buying groceries! Your Ballard Market receipts mean income for Sustainable Ballard! 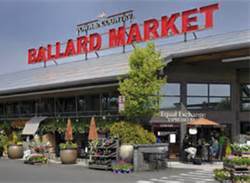 As a non-profit organization registered with Ballard Market, Sustainable Ballard receives a donation of 1% of pre-tax subtotals from receipts we send in to them. Please save your receipts. You can bring them to any Sustainable Ballard event, or mail them to us at 2442 Market Street PMB 286, Seattle 98107. This is EASY money, so keep those receipts coming! Ballard Market only. Thanks!